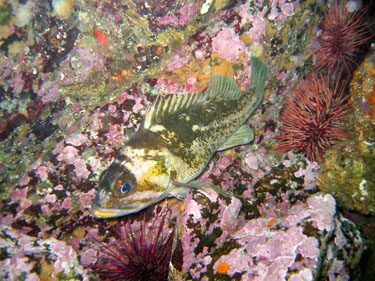 Copper rockfish. Photo credit: Tammy Norgard, Heiltsuk Fisheries. The next steps in the creation of a Marine Protected Area Network are underway for the Northern Shelf Bioregion. This is a collaboration between MaPP partners, comprised of 17 member First Nations and the Province of British Columbia, and the federal government. 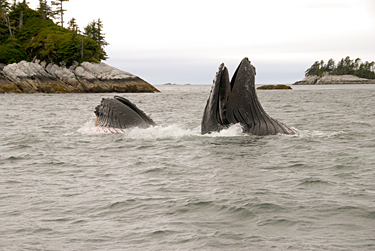 The Marine Protected Area Technical Team (MPATT) – composed of Canada, First Nations and B.C. – is developing recommendations within a network action plan for marine areas to be set aside as part of a network for permanent protection on the north coast of British Columbia. The plan will identify proposed sites and recommend levels of protection. The new MPA network will build on 114 existing protected areas in the region, as well as the zones recommended in MaPP sub-regional marine plans. The MaPP plans, announced in 2015, include a spatial component identifying: general and special management zones to support sustainable human uses; and protection management zones (PMZ) for the protection of marine biodiversity and First Nations cultural and traditional uses. Eelgrass estuary. Photo credit: Doug Neasloss. MPATT member Karen Topelko is a senior marine resource specialist with the Ministry of Forests, Lands, Natural Resource Operations and Rural Development, and has been involved in the MaPP initiative since 2014. MaPP went through a long process to identify zones for protection, she acknowledges, so there may be questions about why they’re not automatically adopted for the MPA Network. That’s because planning for a marine protected area network takes a different approach than choosing individual areas based on local values or interests. Some of the criteria for network design include: selecting sites that will protect a range of habitat for diverse coastal species; including the same habitat type more than once to protect against the impacts of a changing climate and catastrophic events; and, including both big and small protected areas to provide for the long-term survival of species that use different areas for activities such as feeding, resting and breeding. 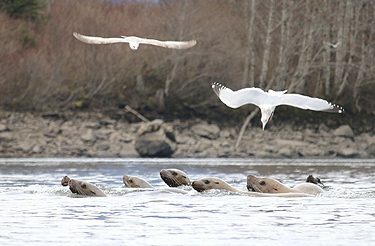 Sea lions and gulls in the Skeena River. Photo credit: Allison Paul. MaPP partners, together with local governments and stakeholders, will continue to implement the management direction described in their sub-regional plans. “We aren’t starting over. We’re building on the results of marine planning initiatives in the region that started with First Nations,” says John Bones, marine co-ordinator for Nanwakolas Council and MPATT member. Important lessons learned from MaPP are helping guide the network planning process, according to MPATT member Sheila Creighton, oceans planner for Fisheries and Oceans Canada. “The MaPP process involved a series of steps that the MPA network process has been able to build on. These include forming the governance structures required for decision-making, compiling and analyzing data, and engaging stakeholders,” she says. Pelagic barnacle. Photo credit: Joanna Smith. John Bones agrees, “The progress to date is a reflection of all three governments being willing to work collaboratively. First Nations are involved and participating vigorously in this network planning process because it’s happening in our territories and we want a big say in how it turns out. The network action plan, expected by March 2019, will go forward for decision by each of the governing parties. It’s anticipated to include a description of the network design approach, final network design, description of network sites, and results of risk and impact analyses. Feeding humpback whale. Photo credit: Greg Tamblyn. Eelgrass is a good measure of coastal health because it is both ecologically important and sensitive to its environment, said Karin Bodtker, a manager at the Coastal Ocean Research Initiative. Eelgrass grows in estuaries throughout the MaPP region. 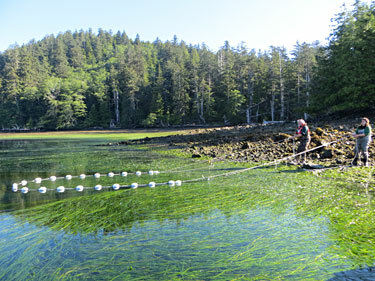 In this photo, two locals harvest seafood from an eelgrass meadow in Haida Gwaii. Photo credit: Nusii Guijaaw. The Marine Plan Partnership for the North Pacific Coast (MaPP) has picked 14 pilot regional indicators that, taken together over the long-term, will provide insights into the health of B.C.’s North Pacific Coast and help guide implementation of coastal management recommendations in MaPP sub-regional plans. 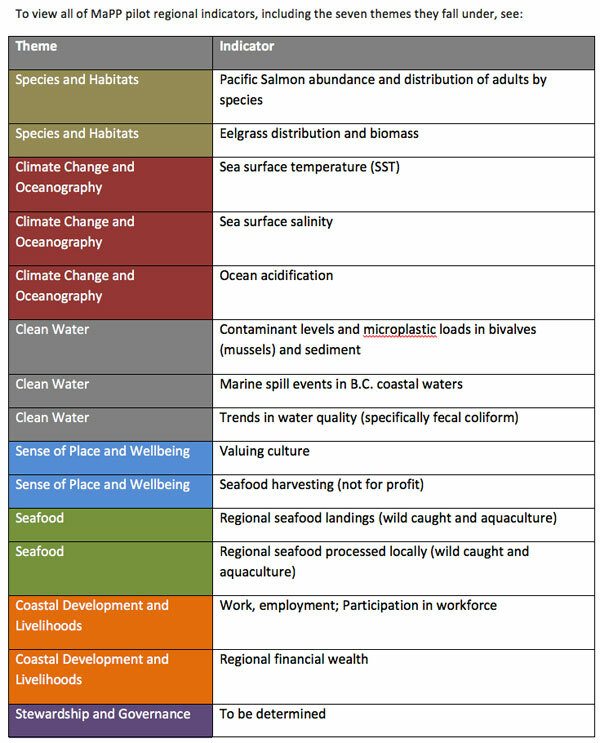 Hundreds of potential ecological, economic and human well-being indicators were initially identified by experts at Uuma Consulting and planning team members of the four MaPP sub-regions: Haida Gwaii, the North Coast, the Central Coast and North Vancouver Island. To select the pilot indicators, MaPP partners and the Coastal Oceans Research Institute (CORI) took feedback from sub-regional workshops and focused on indicators considered high-priority within each sub-region and which made sense to track at a regional scale. As indicators can be expensive and time-consuming to monitor, the team chose indicators that would each provide unique insights without incurring excessive costs. Eelgrass, the ribbon-like seagrass in estuaries throughout the region, was one of the indicators selected. MaPP personnel will track data on eelgrass distribution and biomass regularly during the 20-year implementation period of the MaPP plans. “Eelgrass is one of the most ecologically important habitats. It’s also quite sensitive to pollution, sedimentation, sea level rise and even boats anchoring in it,” said Karin Bodtker a manager with CORI, the independent research institute based at the Vancouver Aquarium, that helped refine the list of indicators with MaPP. “This plant provides habitat for about 80 per cent of marine species of commercial interest,” Bodtker explained. “Juvenile salmon, for example, use eelgrass habitat to find food, hide from predators and as a highway in their migration out to the ocean.” Eelgrass also captures and stores carbon. Understanding eelgrass losses or gains, alongside changes to other indicators like ocean acidity, will help MaPP understand the state of the marine environment and how it is changing over time. “The information collected will support sustainable decision-making along the coast,” said McPhie. Indicators are to be monitored from the middle of Vancouver Island through to the Alaskan border. They fall under seven themes: marine species and habitats; climate change and oceanography; water cleanliness; sense of place and wellbeing; seafood; coastal development and livelihoods; and stewardship and governance. These indicators reflect the MaPP commitment to ecosystem-based management, which prioritizes ecological integrity, human wellbeing and collaborative governance. In keeping with an adaptive approach, certain indicators may be changed if compelling reasons to do so arise, McPhie said. In addition to the pilot regional indicators, sub-regions will have their own unique indicators for which they gather data. The Central Coast, for example, is monitoring crab and Haida Gwaii is monitoring the spread of invasive species, such as tunicates. With regional indicators chosen, data collection is now underway. An analyst at CORI is assembling existing data on many indicators and identifying sampling gaps. MaPP partners are also now developing data management tools and public reporting strategies. “By the end of 2019 we expect a comprehensive report with regional data for all the pilot indicators and how those data relate to MaPP strategies. Analysis of the data will tell us if our strategies are working and if we need to change our strategies because of ecosystem changes,” McPhie said. “The purpose of indicator monitoring is to lead to better decision making. The Province can use the data to set or affirm priorities, allocate resources and inform policy and decision making,” said Kristin Worsley, manager of B.C.’s marine and coastal resources section and member of MaPP’s secretariat. List of MaPP pilot regional indicators. Credit: MaPP. The white-bordered area in this satellite image shows the B.C. coastal region addressed by the Regional Action Framework (RAF). Each of the four sub-regions, whose locally-developed marine plans were used to create the RAF, are shown within the RAF boundary. The Regional Action Framework (RAF) is the result of intensive consultation and planning for marine areas along the North Pacific Coast of B.C., from Campbell River through to the Alaskan border. Its broad view prioritizes both ecosystem and human well-being, as well as collaborative and efficient marine management. With a 20-year scope, implementation of the RAF is now underway. 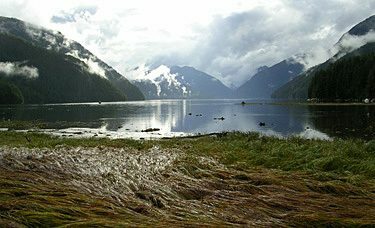 The Marine Plan Partnership (MaPP) plan area is comprised of four sub-regions: Haida Gwaii, the North Coast, the Central Coast and North Vancouver Island. As each sub-region has its own unique set of marine environments, local values, governance mechanisms, and socio-economic contexts, the MaPP partners agreed in 2011 that each sub-region would develop its own goals for marine management, in consultation with local stakeholders. Knowing there would be some overlap among all sub-regional priorities, MaPP partners agreed in the same year to also create a framework that considers the entire region, looking at broad ecosystem issues as a whole. The result is the RAF, completed in May 2016. It identifies common elements from all four sub-regional marine plans, and supports the sub-regions to work together in addressing common goals. This collaboration on the actions identified in the RAF will benefit the region as a whole, saving time and money. Over the 20-year implementation period the RAF aims to improve both coastal community and ocean health. Implementation of some shared priorities is already well-underway. One priority is developing and monitoring indicators for both human well-being in the region, which includes monitoring new economic opportunities and investments, as well as ecological integrity, which includes monitoring ocean conditions, intertidal life and species composition. “For example, MaPP technicians and community members from all sub-regions identified that monitoring eelgrass abundance and distribution was important, so that will likely become one of our regional indicators,” said Romney McPhie, the regional projects coordinator for MaPP, who helps coordinate MaPP partners across the sub-regions. “Observing these trends in eelgrass beds over time will help MaPP partners assess how their actions on other priorities may be impacting eelgrass”, McPhie noted. Ecosystem-based management underlies the RAF, where both ecological and human well-being are considered as components of an entire system. It’s an adaptive approach, and in keeping with that, evaluations and adjustments will be made to the RAF every five years. Planning undertaken by MaPP partners, including creation of the RAF, has demonstrated an unprecedented level of collaboration in marine management for B.C.’s coast. The provincial government and 18 First Nations partnered during the planning phase, and collaboration between the Province and First Nations continues throughout implementation. Traditional knowledge and values of partner First Nations were an integral part of developing the RAF, along with provincial government priorities, and local community values. The RAF also received input from an advisory committee of marine-based stakeholders, including industry representatives, conservationists, recreationalists, and elected local officials, as well as from a science advisory committee. Additional RAF actions underway include identifying climate change indicators that will inform response strategies, assessing cumulative effects of overlapping activities in coastal areas, supporting and coordinating pollution responses, coordinating and supporting the development of marine emergency response plans and planned performance monitoring to ensure that the RAF is effectively implemented. Through the RAF and sub-regional plans, MaPP partners aim to improve coastal ocean health, increase employment in local communities and diversify jobs, and give proponents more certainty concerning their investments in the coastal zone. Over the long-term, the RAF will enable a broader understanding of how the ocean works and ensure all those concerned have a deeper understanding of how to manage the North Pacific Coast of B.C. more holistically and efficiently. A little wine with dinner won’t hurt you. But what if you added a glass of scotch before every meal and a bag of chips between meals every day? What might the cumulative effects be on your heart, your liver, your state of mind? If you knew what this combination of “inputs” would do to your physical, emotional and economic well-being, you might make different decisions – or perhaps regulate your behaviour. 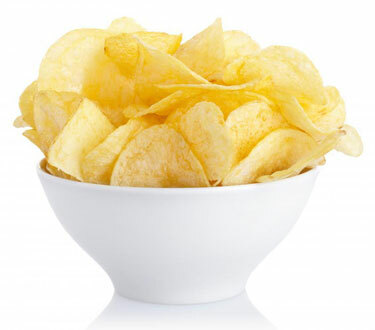 Perhaps you would measure your weight, waistline and blood pressure and think ahead 10 years to see what the cumulative effect of your current behaviour might be of your overall health. With help from consulting biologist Steven Wilson, the MaPP initiative hopes to apply this kind of thinking to decision-making for the marine environment. Called cumulative effects assessment, the MaPP initiative is looking for ways to capture the combined effects over time of multiple activities and factors on ocean habitats. The Province of British Columbia is working on a broad cumulative effects strategy that will include the marine environment. This strategy, known as the Cumulative Effects Framework, is developing a new approach and tools for assessing and managing cumulative effects in the province. Jointly led by the Ministries of Environment and Forests, Lands and Natural Resource Operations, the framework approach was defined, tested in regional demonstration projects and evaluated to assess the implications of the provincial implementation. Phased implementation of the Framework began in spring of 2014. The MaPP initiative is a partner to test the Framework, and is providing valuable input on how the terrestrial and marine cumulative effects frameworks intersect through the inter-relationships between land and sea. To learn more about the Cumulative Effects Framework visit their website. This dovetails nicely with the broader development of marine plans, where Wilson has helped the MaPP initiative to adapt the Cumulative Effects Framework for the North Pacific coast. Similar to the broader provincial efforts, the goal of the framework is to inform both management and regulatory processes and, in doing so, improve the stewardship of coastal and marine ecosystems and the human well-being of coastal communities. Wilson explains that there are three major types of challenges related to determining cumulative effects in the marine environment: informational, regulatory and institutional legacy. Because cumulative effects assessment and management is a relatively new field, there is less information about the interactive effects of various marine activities. So Wilson identifies a regulatory problem, which is linked to the information problem. “If you don’t have the information, it’s hard to set regulations,” he says. There are no quick fixes to address the challenges associated with identifying and managing cumulative effects in the MaPP study area but the MaPP Cumulative Effects Assessment Framework is a start. It’s hard to plan for something you hope will never happen, and yet being prepared for a crisis increases the chances of managing an emergency efficiently and equitably. Today on the coast there is significant marine traffic, and with that traffic come risks. Yet at the same time, this traffic helps generate economic activity and jobs up and down the coast. It is critical to ensure that this traffic stays safe and that there are plans in place should an accident happen. For coastal communities, one way of getting prepared could mean developing a geographic response plan (GRP) – a plan that can kick into action within the first hours of an incident, often well before emergency response agencies can get to the scene. GRPs consider the multiple priorities of coastal communities – social, cultural, ecological, and economic. Because GRPs pre-identify priorities such as areas for protection, location of human and equipment resources, and places of refuge for troubled vessels, they can accelerate response time and help to reduce the threat and impacts of an incident. One deliverable of the MaPP initiative is to help communities in the MaPP study area understand and define the nature and scope of GRPs. The initiative has contracted environmental emergency response planner Stafford Reid to begin the work. “Geographic response plans are part of coastal planning management – a tool for managing the impacts from all types of vessels and all types of cargo,” Reid says. 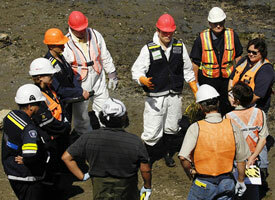 The tough work in emergency response planning is determining the priorities for first responders. What gets first attention – a cultural heritage site, environmentally sensitive habitat, or a business? The process needs to be collaborative, transparent and considerate of diverse possibilities, since trade-offs are inevitable and difficult decisions have to be made. And in the moment of a crisis, there is little time for discussion. The Incident Command Post integrates many response teams, including Canadian Coast Guard, Fisheries and Oceans Canada, Environment Canada, Ministry of Environment, First Nations and local government, as well as the ship owner and its contracted response organization. GRPs, which are well developed in the United States, have evolved from hard-copy documents to web-based, multi-media applications that include geographic information systems, databases, documents, images and videos. GRP design and development is new to Canada. The MaPP initiative has compiled a suite of studies and datasets that could support GRP development, not to mention the wealth of on-the-ground knowledge and expertise in coastal communities. In addition to the draft marine plans, MaPP resources include traditional, local and scientific knowledge, technical expertise and mapping/planning tools such as the marine planning portal with over 300 data layers. 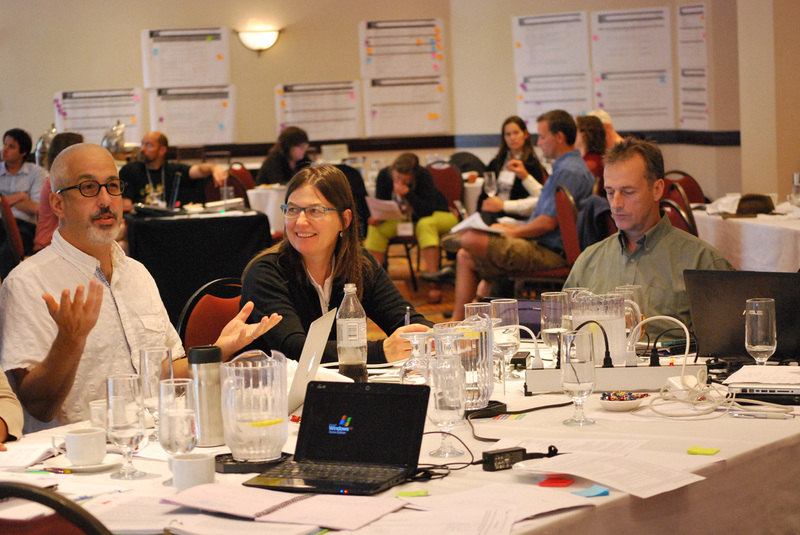 MaPP workshop participants explore options for an integrated suite of human well-being and ecological indicators. What does your doctor do if you show up in his or her office complaining of a pain on the left side of your chest? Take your blood pressure? Check out your cholesterol? In fact, today’s health practitioners are starting to do a lot more than that. They might ask you about your eating habits (too much unhealthy fast food? ), your stress levels, and what you’re doing for exercise. Just as our society has started to adopt a more holistic view of health, we’ve also realized that it might help us to look at other aspects of our lives through a variety of lenses. That, at least, is the premise of ecosystem-based management, or EBM, the type of approach that’s been adopted by the MaPP initiative. “You can’t look at things in a single box,” says Andrew Day, a natural resource expert and consultant who has been contracted by the MaPP initiative to develop an integrated suite of human well-being and ecological indicators. When considering a particular agency’s viewpoint, for example, Day knows it’s just as important to consider the perspectives of First Nations, businesses, scientists, non-profit groups, and the public. Day says all these views are valuable and by acknowledging and respecting them it’s possible to get a better understanding of what’s happening in the system. It also helps to understand how human well-being indicators (social, economic, cultural, and technological) are interconnected with ecological well-being indicators such as species and habitats. “One of the big questions is understanding how things relate to each other and the consequences of different decisions and actions,” Day says. Day says that one of the keys to success in the 21st century will be understanding interdependence and “trying to understand and respect the ways in which what you do over here, is going to affect what you get over there.” He recognizes this is difficult to do, in part because it is not the way systems, operations, and thinking occurred during the industrial revolution. In B.C., the MaPP initiative has hired Day to recommend indicators and options for monitoring the marine area. His team has reviewed indicators from other parts of the world, conducted surveys of more than 200 ecological experts, and facilitated several workshops with businesses, governments, scientists, managers and First Nations. They have reduced more than 1,000 potential indicators to a suite of about 50. Team members are now working on guide sheets for the recommended indicators and looking at different monitoring programs and partnerships. While eating more fish might seem like a simple, healthy dietary decision, in fact, it also offers consumers the chance to make a big difference to coastal communities in British Columbia. That’s the passionate belief of Jamie Alley, a former director with the B.C. Ministry of Environment, now retired and consulting to government, First Nations and the seafood industry. “The seafood industry is not in sunset – in fact, it’s in sunrise,” he says. 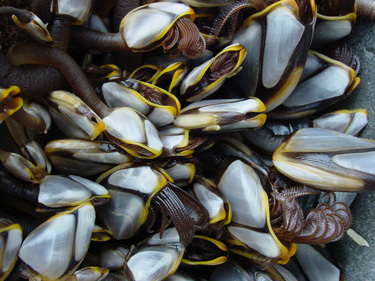 “Seafood is one of the most globally traded commodities. And considering the quality of the resource here, our industry is relatively underdeveloped. This is because B.C.’s oceans and fresh waters support more than 100 species of fish, shellfish and marine plants. With a combined current wholesale value of more than $1.4 billion, B.C. 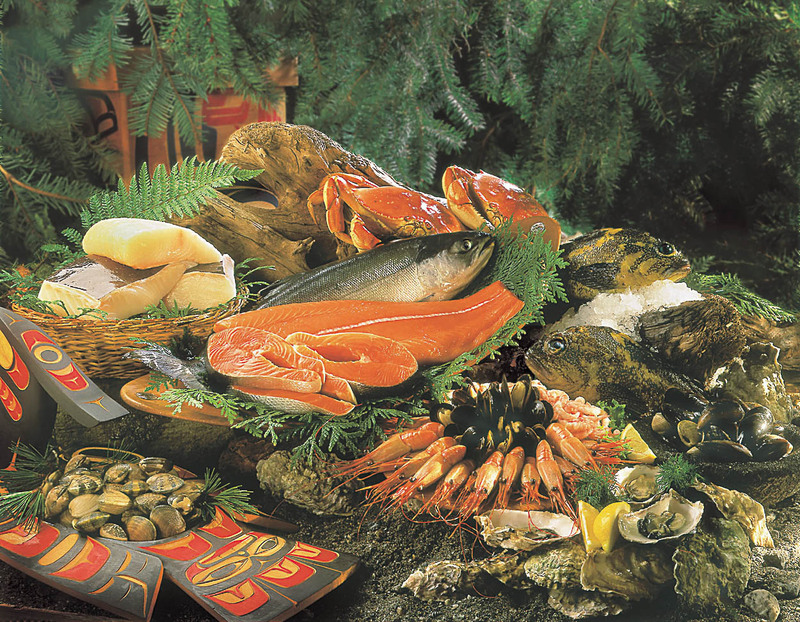 seafood travels around the world, with some 80 per cent of it being exported. In 2011, it ended up in two billion meals in 74 countries. Sales of B.C. sablefish in Europe have increased dramatically since Alley’s trip, going from only $220,000 in 2007 to well over $3 million in 2012. Alley believes that the secret to continued success is shifting from a high-quantity fishery with a low value – to a low-quantity fishery with a high value. Stories like the sablefish one have helped convince him that fish are more than simply a delicious food. They are also an economic engine for rural B.C. According to Alley, jobs in the seafood industry in coastal communities are comparatively more valuable to the social and economic fabric of British Columbia than service sector jobs in the Lower Mainland. “Seafood-industry jobs pay relatively well,” he says. These jobs tend to be located in smaller, coastal areas where overall unemployment rates can be high. Fisheries-related jobs, like those at seafood processing facilities, are particularly important for First Nations people, many of whom live in remote communities, far from urban centres. “There’s no other part of the coastal economy that has such a high participation of First Nations,” Alley says. First Nations people represent roughly 30 per cent of the workforce in the seafood-processing sector. B.C. also has some of the best, most sustainably managed fisheries in the world. The global standard for seafood eco-certification, the Marine Stewardship Council (MSC), has developed tough, best-practice standards for sustainable fishing and seafood traceability. The group’s mission? To recognize and reward sustainable fishing practices and thereby improve the health of the world’s oceans. Six fisheries in B.C. are currently MSC certified and more are in the works. These are British Columbia chum, pink and sockeye salmon, albacore tuna, Pacific hake mid-water trawl, and Pacific halibut. 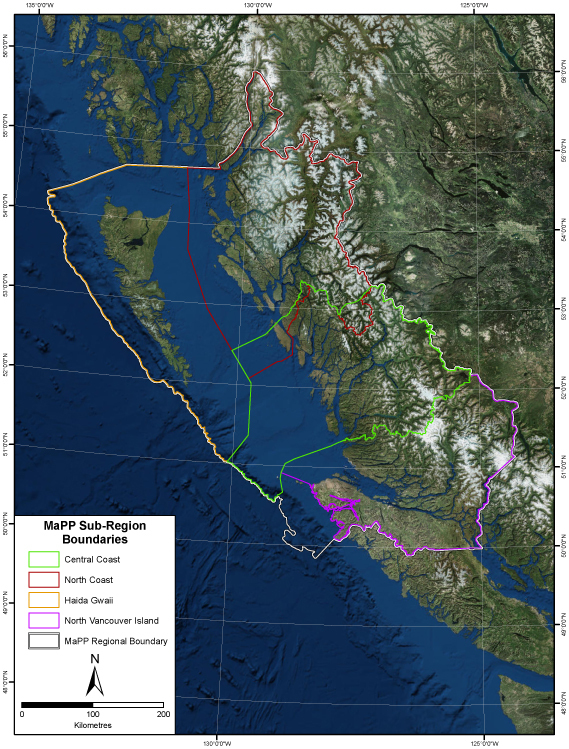 In the MaPP study area, five fisheries are currently MSC certified – north and central coast chum salmon are in assessment. 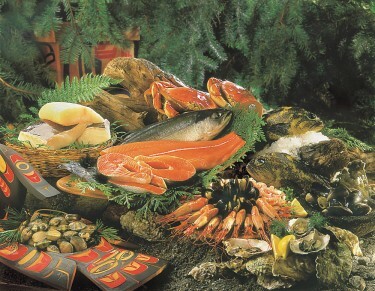 According to the 2011 British Columbia Seafood Year in Review, published by the B.C. Ministry of Agriculture, some 63 per cent of British Columbia’s groundfish harvest and 60 per cent of the salmon harvest was from MSC-certified fisheries. Overall, 47 per cent of B.C.’s wild capture fisheries harvest was from MSC-certified fisheries. Certified fisheries can use the eco-label program to market their products and influence the choices consumers make when buying seafood. An essential benefit of a geographic response plan is the process – ensuring partnerships between all levels of government (First Nations, provincial, and federal) and industry.